WBC is Returning to Walla Walla - Write for Wine: It's Wine O'Clock Somewhere!Write for Wine: It's Wine O'Clock Somewhere! This year’s keynote speaker is Lewis Perdue, an award-winning journalist, long-time blogger and former journalism professor. Wine education sessions include a sherry wine specialist certification course and learning more about Uruguay. Wine discovery sessions feature Italian wines, Albariño and Rioja. In addition, other wine regions in Washington state — Wine Yakima Valley, Red Mountain AVA Alliance and Cascade Valley Wine Country — are sponsoring luncheons and excursions. Here is the full agenda. 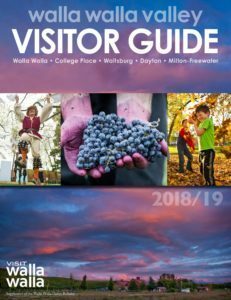 Of note, Walla Walla is home to more than 120 wineries, 2,800 acres of grapes, produces outstanding wine, and offers a creative culinary scene. Walla Walla’s wineries and tasting rooms are located in four main areas: downtown (which now features more than 40 tasting rooms), the west side, east side, and south of town, including a handful of wineries across the border in Oregon. More details can be found at Visit Walla Walla and Walla Walla Valley Wine Alliance. Some of our favorite wineries (in no particular order) are Figgins, Toil Oregon, Leonetti, Cayuse, Reynvaan, Result of a Crush, Saviah Cellars, Va Piano, Long Shadows, Corliss, L’Ecole 41, Woodward Canyon, Mullan Road Cellars, Otis Kenyon, Walla Walla Vintners, Dunham Cellars, The Walls, Henry Earl, Amavi, Cadaretta, Buty, Doubleback, Northstar, Pepper Bridge, Abeja, Sleight of Hand, Spring Valley, and Watermill. And yes, there are more. It’s always exciting when the WBC community has the opportunity to be awed by the fabulous wine that Washington state is creating. Stay tuned for more here, and on Instagram, Facebook and Twitter, with the hashtag #WBC18. This entry was posted in Walla Walla, Washington, Wine, Wine Country, Wine Events and tagged Dunham Cellars, Figgins, L'Ecole 41, Long Shadows, Mullan Road Cellars, Saviah Cellars, Toil Oregon, Va Piano Vineyards, Visit Walla Walla, Walla Walla, Walla Walla Valley Wine Alliance, Washington wine, Washington wineries, wine, Wine Bloggers Conference, wineries, Woodward Canyon by Margot. Bookmark the permalink.